Depending on the cause, feline blindness can come on suddenly or show up over a period of time. From injury to various diseases, being aware of the possible reasons for cat vision loss can help owners spot a problem sooner and consult a veterinarian immediately. You may not realize it, but the normal eyesight of a cat is superior to the eyesight of a human with 20/20 vision. This means cats are already starting out with an advantage over humans, but that's not the end of the story. Along with superior vision, cats are equipped with other heightened senses that help them find their way around. A cat's whiskers are an extremely important part of its sensory system, and so are the hairs between the pads of the paws. By no means as sensitive as a dog's olfactory system, a cat's sense of smell is also far more delicate than our own. They can smell things we normally only rely on our vision to detect, such as water. Since cats make such good use of their other senses, they are not at as much of a disadvantage when their sight begins to fail. This is why many owners simply do not realize that their cat is losing vision until the problem is well advanced. Take a look at some of the most common causes of feline blindness, and then get tips on how to help an affected cat. Glaucoma is a leading cause of feline blindness. The condition causes a build up of pressure within the eyeball that gradually distorts the vision. The disease is treatable in the early stages by administering medication. If left untreated, the damage to the ocular nerve and retina result in permanent blindness. Although not commonly found in cats, cataracts can lead to blindness. 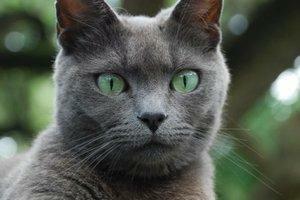 The condition in felines is typically caused by an injury to the eye that leads to a clouding of the lens. The lens itself is composed of protein and water. In a healthy lens, the arrangement of the protein allows light to pass through the lens, but when the protein is damaged, it begins to clump together. This causes the signature thick and cloudy look associated with cataracts. If the cataract continues to spread, it will require surgery to correct the problem. Simply referred to as PRA blindness, this incurable condition commonly linked with canines takes its toll on the feline population too. According to UC Davis Veterinary Medicine, PRA causes a slow degeneration of the retinal tissue, resulting in gradual and eventually complete blindness. There is no cure for this disease. Cats already suffering from illnesses such as kidney disease or diabetes may also be at risk for hypertension. This condition can be hard to detect without a veterinarian's help, but symptoms can include bloodshot eyes and unresponsive pupils. A cat with hypertension should be treated with calcium channel blockers, ACE inhibitors, and other appropriate medications, including medications to treat any underlying, diagnosed condition that may be the cause for the high blood pressure. The animal should also be monitored on a regular basis to see how his body reacts to the medication in case the dosage needs to be adjusted. Home management of this condition may also include, upon recommendation from your veterinarian, providing your cat with a low-sodium diet and reducing stress in his environment. This is in addition to providing the proper treatment for any accompanying conditions. According to VCA Hospitals, eye tumors such as melanomas can cause blindness in cats. Some cases can be treated by surgical removal of just the mass, but in others it may be necessary to remove the entire eyeball, resulting in permanent blindness. Conjunctivitis is an infection that causes the inner eyelid to become red, swollen and itchy, all symptoms indicated by the nickname pink eye. It can have a number of causes, including Chlamydia and herpes virus. Although blindness is not a direct result of a conjunctivitis infection, recurring infections can cause vision deterioration as your cat rubs its eyes to get some relief. Treatment for conjunctivitis includes administering medication either orally or with eye drops, depending on whether the source of the infection is bacterial or viral. However, it is tough to get rid of, and the infection is likely to resurface in the future. Injuries, whether self-inflicted from scratching or caused by fights or accidents, can easily cause scarring or loss of an eye. Treatments vary according to each situation, but it's not always possible to prevent sight loss. Medical treatment is essential, but you may still have to resign yourself to your pet's loss of sight. Here are a few tips about living with a blind cat. Keep things in the same place. Resist the urge to rearrange your furniture or move your cat's litter box and food dishes. Keep clutter to a minimum. The less obstacles your cat has to negotiate, the better off he'll be. Maintain your cat's regular schedule. Now is not the time to begin feeding in the evening rather than the morning, or vice versa. Major schedule changes will only add to your cat's disorientation. Try to keep your own work schedule on an even keel. Your cat never could read a clock, but he has become accustomed to your regular comings and goings, and will depend on that schedule now more than ever. Talk softly to your cat to announce your presence. Chances are he's already caught your scent, but it's always good to remind him you're there without startling him too much. The sooner you realize your cat has difficulty seeing, the sooner you can get him the treatment he needs. Although blindness isn't always preventable, early treatment may save a cat's sight in some cases, or at least extend his vision a little longer. Always consult your vet as soon as you can for the best possible outcome.